Hello and welcome to the Brompton Library Graphic Novel Reading Group. For the next session, Monday 8 April, 6:30pm, we will be discussing Doctor Ian Williams’ illustrated anecdotes of The Bad Doctor. Cartoonist and Dr Ian Williams takes his stethoscope to Dr Iwan James, a rural GP in need of more than a little care himself. Incontinent old ladies, men with eagle tattoos, traumatised widowers, Iwan’s patients cause him both empathy and dismay, further complicated by his feelings for his practise partners: unrequited longing for Dr Lois Pritchard and frustration at the antics of Dr Robert Smith, who will use any means to make Iwan look bad in his presence. Iwan’s cycling trips with his friend and mentor, Arthur, provide some welcome relief for him. Shakespeare’s plays aren’t just read and studied at school, college or university. Reading groups, extension courses, lifelong learning, theatre workshops, before going to see a play at the theatre – and more. Shakespeare has inspired the work of so many creative people: from Mendelsohn, Britten, Shostakovich to Lou Reed, Dire Straits and Arctic Monkeys. From Herman Melville, John Keats, Charles Dickens to Aldous Huxley, Iris Murdoch and Ian McEwan. From Kurosawa to Polanski. From the Pre-Raphaelites to Gillian Wearing. Every age, indeed every generation seek to make Shakespeare their own. Walk into any library and if you are prepared to explore, you can find his influence everywhere. This can be seen in the countless films based on his work. This is a film based on Nikolai Leskov’s 1865 novel, Lady Macbeth of the Mtsensk District , itself inspired by Shakespeare’s play, Macbeth. The film is set in the north of England during the nineteenth century, whereby the Lady Macbeth character is brought centre-stage in this alternative narrative to the Shakespearean text. Gone is the witchcraft from Shakespeare’s Macbeth – the only ‘spirits that tend on mortal thoughts’ – here in William Oldroyd’s film, arise from the emptiness of a bourgeois life, in which Lady Macbeth finds herself trapped and powerless in a male dominated environment. There are also parallels here to Flaubert’s, Madame Bovary. As the subject of an arranged marriage deal, acquired by the father for his son, along with a small piece of land, that he describes as ‘not fit for a cow to graze upon’, Lady Macbeth is installed into a stifling and austere household, where she is abandoned for long periods of time by a callous husband. She is left to maintain the house and servants following the demands of the father, who expects a submissive and obedient daughter in-law. There are no books to be seen and many of the early film shots see her peering out of the window onto a barren landscape, or asleep for long periods on the sofa. She appears completely isolated in this new situation. Within this repressive and patriarchal environment, we are left to speculate as to the kind of character she is and how she will respond. Her responses at first are reluctant obedience and boredom, but the performance of Florence Pugh as Lady Macbeth is captivating in that as time goes on, we witness signs of insolence: mocking facial expressions and a contemptuous intonation in her voice, when addressing her husband and father in-law. The husband then departs for an extended period, in order to sort out problems at the family colliery and Lady Macbeth is left alone with the servants. At this point, her authority is challenged by an incident among the servants, and then we see her take control. She begins a passionate love affair with the groomsman. As time goes on, like Shakespeare’s Lady Macbeth, her ‘vaulting ambition’ leads to a murder – in this case, the husband. Again, there is excitement in Pugh’s performance, never being quite sure if she is a victim of circumstance, responding perhaps naively as the repressed bourgeois housewife to events spiralling out of control, or whether there is a more psychopathic vein running through her actions. This loss of control is something we witness in Shakespeare’s Macbeth – was he (Macbeth) ever really, ‘full of the milk of human kindness’? or have circumstances conspired around him to bring about a tragedy? – a key concern in Shakespeare’s play. Here too, innocence and guilt seem to play out, side by side. Casting a black maid who, rarely speaks and a mixed-race actor as the groomsman, adds a racial tension to the power dynamics of repression and rebellion that are described by the shifting loyalties among the principal characters of the film. The visual look of the film focuses on textures: the tactile feel of starched fabrics on soft skin, rain on slate and stone and naked wooden floorboards sounding to the pressure of impatient male footsteps. There is also a clearly defined soundscape to the film, that captures the rustle of fabrics, the chink of chinaware and the howling winds on the heath outside the house – all these effects build a formal language that serves to emphasize common themes of vulnerability and violence, power and submission. In addition to this film, you can find other adaptations on Shakespeare’s work in our libraries and of course most of his plays and poetry including some of the literary criticism that goes with them – Shakespeare is, of course, a huge industry. The children’s library also has some of his plays translated into short stories, Manga comics etc. 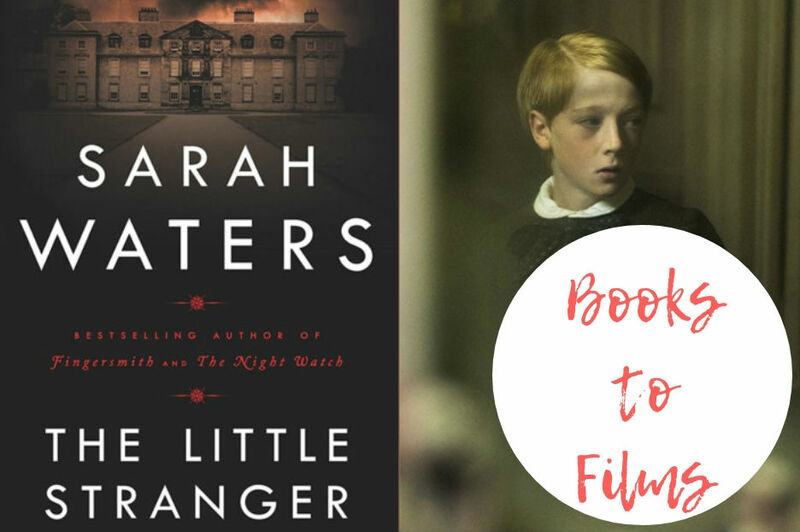 This month, Fiona from Brompton Library is reviewing Sarah Waters, The Little Stranger which has just been released as a film and will be read and discussed by the library’s reading group in November. Set in post-war rural Warwickshire, Dr Faraday is called to attend a sickly maid at Hundreds Hall who believes that the house is haunted. Faraday has a sentimental attachment to the house as his mother had been in service their as a maid and once took him there when he was a child to a garden party where he was presented with a medal by the lady of the house, Mrs Ayers. As Faraday gets closer to the Ayers family, events start to unravel. Strange and inexplicable happenings that suggest a ghost from the past is haunting the family and as their financial situation worsens and the house starts to fall apart around them, the “haunting” intensifies. Behind the story of the house is also a love story between Caroline Ayers and Dr Faraday and behind all of it is the story of post-war Britain, the introduction of the NHS and how that changed the lives of ordinary people. There is a strong contrast between the lives of the Ayers family at Hundreds Hall where, in the decaying house, guests dress formally for dinners served to them by a maid while local people, still wary of modern medicine, are dying young from curable ailments and too poor to be able to pay the doctor. The book is a gripping read. I read half of its 500 pages on a flight and was completely engaged by the writing, the atmosphere and the story. The relationship between Caroline Ayers and Dr Faraday is beautifully written and touchingly awkward and I liked the way the book dealt with several themes at once while remaining a really good story well told, and very creepy in parts. At one point, Dr Faraday says “All this house needs is a dose of happiness”. You get a sense that they are both so lonely in their different ways and that everything could change for them if they could make it work. I felt that the more a I read the book the more I also wanted the house to be rescued and saved from ruin as the Dr does. It works really well that Waters does not use tricks to build up the adrenalin of the story and the overall pace is one of gradual decline, so if you are wanting to read a ghost story this may not be for you, and the end has a twist that creeps up on you so quietly that you almost can’t quite believe it. The film brings the book to life visually. It really captures how I imagined the house to look – its interiors are perfectly done and the view of the house from the road leading up to it were very evocative of the book. The house is very grey and you get a sense that the seasons change outside while the house is stuck in time. Although billed as a horror, the film leaves out much of the references to ghosts that are made in the book, but is more like a ghost story. As the film is much shorter than the book, the suspense builds much more quickly and there were some chilling moments, but on the downside it meant that we didn’t spend much time with the characters or see their relationships develop. Charlotte Rampling is perfect as Mrs Ayers while saying very little, she appears icy and fleeting throughout the house. Ruth Wilson is great as Caroline Ayers, bringing to life the earthy and practical daughter of the house who holds the story together. The casting of Domhnall Gleeson let the film down a bit for me. Dr Faraday is in his 40s in the novel which lends a fatherly aspect to the middle-aged, unmarried doctor that would not be possible between Gleeson and Wilson as they are of a similar age (he may even be younger than her). He came across as cold and remote at the same time but lacked the warmth and drive of the Dr Faraday of the book and I wasn’t rooting for him like. Overall it’s not a bad adaptation with some great acting, a few chills and shocks and is visually very true to the book. 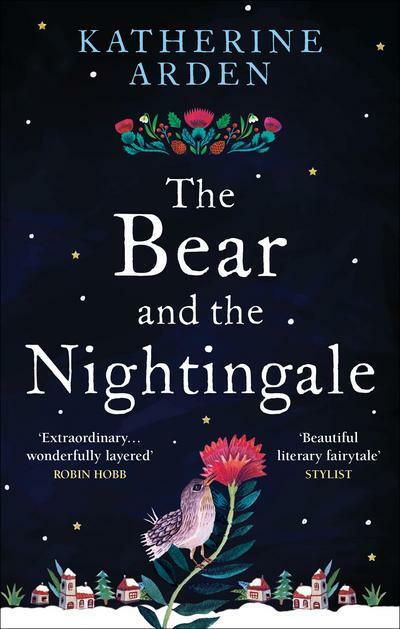 Brompton Library’s reading group will be discussing the book on Tuesday 6 November so why not join us? You can borrow a copy at any of our libraries. A researcher working for a BBC World Service series, The Why Factor, contacted us to meet a book group for their latest programme “Why we forget the things we have learned“. The Why Factor is a BBC Radio magazine programme, a series of 25 minute shows that mixes vox pop and academic specialists, brought together by a presenter. We arranged for the show’s producer to talk to local book group members (who kindly agreed to participate), and we all met in Brompton Library’s Meeting Room . Rather shyly, members of our group answered questions fired by the producer who held a huge microphone attached to a tiny recorder. A couple of us (blink and you miss us) were edited into the first couple of seconds of the programme before the show segued into the main essay. But what was most important, Brompton Library got a mention – and the programme itself was quite interesting. I was greatly encouraged by some of the observations about forgetfulness made in the programme. Apparently forgetfulness can be the result of a creative brain flying around taking in all sorts of sensory information which can later be selected from, unless it has been forgotten …. When we are in our book group, reading novels, we are turning over the plot and sharing feelings about the characters, etc., but we are also using our creative brains, employing our memories to add snippets of our own knowledge and experience. We are finding new ways of seeing – being curious. In this way, though discussion, people can renew their interest in the novel, go back and re-read it or, if they had not quite got to the end, decide to try again and even finish it! Quite often a good book encourages interest in the author. For example, recently, having read Penelope Fitzgerald’s The Bookshop, members of the group were able to take their interest further by accessing and reading Hermione Lee’s fascinating account of Fitzgerald’s personal and literary life – which is available from our wonderfully maintained biography store at Kensington Central Library. With a good public library service everyone can be a researcher! Please try to remember that …. The fourth book is on its way, tell us about that. It’s called Flip Back and it deals with the British psychedelic folk scene of the late 1960s and early ’70s. Among my research for that I read an excellent book called White Bicycles by Joe Boyd. What were some of your musical inspirations from the 60s and 70s? Bob Dylan, the Rolling Stones, Steely Dan, Neil Young, Joni Mitchell. I read in another interview with you that each of the Vinyl Detective novels has a spirit animal. How does that help you with writing the novels and why is this important to you? It’s just something that arose without me thinking about it. I am fascinated by animals and wildlife, and very fond of them, and appalled by their treatment at the hands of humans. So that just sort of naturally wove its way into my writing. When I became aware of what I was doing, I made it more deliberate. And started referring to it by that ‘spirit animal’ malarkey… though it’s certainly malarkey I genuinely subscribe to. Are there any plans to make the books into a TV series or film? My agent regularly gets enquiries, which have so far led to one serious meeting but nothing further than that. And finally, we can’t leave without mentioning Doctor Who. You worked as a show runner and script editor on the TV series, and have since written many of the Doctor Who comics. What was it like to work on such a classic show? It was a privilege. It was also the gift which keeps on giving, in the sense that it’s given me a calling card which never expires, and has led to me meeting a lot of interest people and travelling all over the world. Were you a fan before you worked on the show? You have written novels, audio dramas, television scripts, graphic novels and also several stage plays. Which genre do you prefer? Each has its own particular appeal and its own unique challenges. I like switching from one to the other. But my two favourites are the novel, for its intimacy and clarity of expression, and the stage play for the magic it conjures up through taking place in real time, with real people, in a shared space. The graphic novel Sabrina by Nick Drnaso has been longlisted for the Booker Prize this year. How easy or difficult do you think it might be to judge a graphic novel against a traditional novel? I don’t see how you can compare the two forms. What three pieces of advice would you give any aspiring writers out there? Keep your covering emails very brief. Give your characters interesting names. 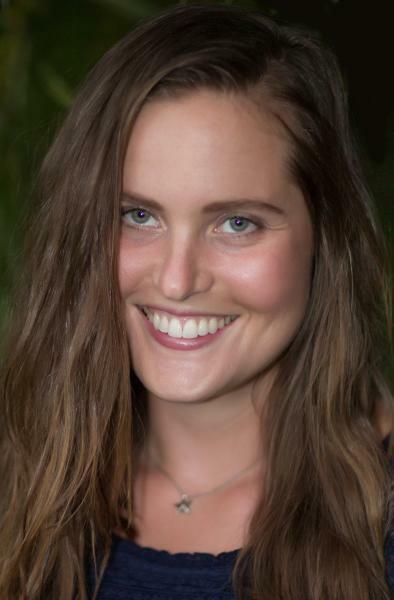 Have your work read by people you know, whom you can trust to be ruthless — or at least honest — and seriously consider their feedback before you send it out and waste the time of an agent or editor. 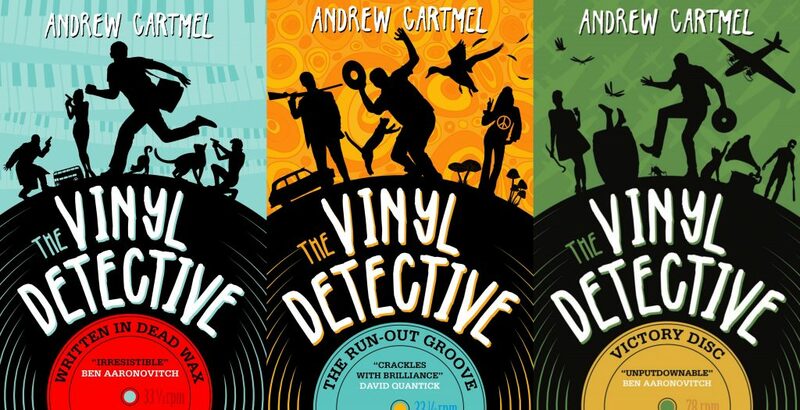 Finishing the fourth Vinyl Detective, then rewriting a stage play, then writing a new stage play, then writing a graphic novel for the Rivers of London series, which I co-write with Ben Aaronovitch. Thank you for your time Andrew and very much looking forward to meeting you on 24 September at Brompton Library. On the second Monday of every month, our graphic novel reading group meets at Brompton Library. The group is run by David at Brompton Library, and he spoke to three of its members to find out what they like about the group and their favourite graphic novels. What is it about the reading group that you enjoy? In this my first year , what impressed me was the range of the graphic novel form. I started reading comic books as a kid and then came back in the 1990s by discovering the subculture with its fairs and cons, trying out books like Joe Sacco’s Palestine and manga like Akira. The diversity I discovered through the group is reflected in members’ choice of works and how we discuss them. Other readers’ focus on imagery has certainly advanced my appreciation of how to discuss sequential art. What has been your favourite graphic novel that you’ve read? Ghost World by Daniel Clowes, a teenage novel. Democracy tells the story of one turning point in the history of ancient Athens. It satisfies both as a story and as an introduction to the subject. It has an art of strong colours with an edge of blackness but it’s no lecture. Ghost World is a narrower canvas with smaller panels and is the tale of a friendship in a small town – two girls growing up and growing apart. It seems that as well as mind-challenging futures, like Ghost in the Shell, a ‘graphic’ can tell a simple story like this with all its resonance in pictures and character. Reading it on the tube seemed more involving than sheer prose, even though it’s not fantasy as such. Lastly, my time in the group has convinced me that the ‘graphic’ still has great possibilities which haven’t yet been fully explored. I’ve really enjoyed being a club member for exactly that reason; it’s helped introduce me to great reads that I would have never have investigated on my own, as well as giving me access to comics I’ve wanted to read for a long time. Plus, it’s been really fun getting to know the other members too. Before I joined, I was apprehensive about not being accepted, as I didn’t have much knowledge about certain comics. But now, I really look forward to and enjoy spending at least an hour a week discussing our thoughts on the comics we’ve read together, especially because we’re all from very different comic-reading backgrounds so everyone can have very different perspectives and opinions. I was also happily surprised at just how many graphic novels and manga titles the library has to offer. 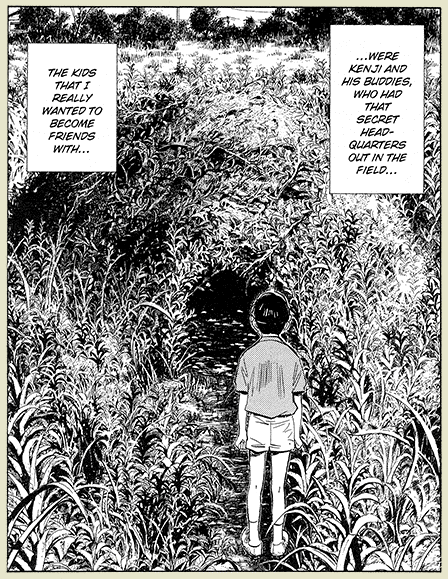 I can really recommend a lot of the available manga, but one in particular that we read with the group was, 20th Century Boys written and illustrated by Naoki Urasawa; This was a series I had really wanted to read for a while. It’s an incredibly gripping conspiracy drama with cleverly thought out engaging characters and a cliff-hanger ending with every volume so it was great to get the opportunity to read a lot into the series using the library’s copies. All in all, joining the group has been one of the simplest, most rewarding things I’ve done in 2017, and I really recommend to anyone interested in comics or graphic novels, to join us in 2018!! 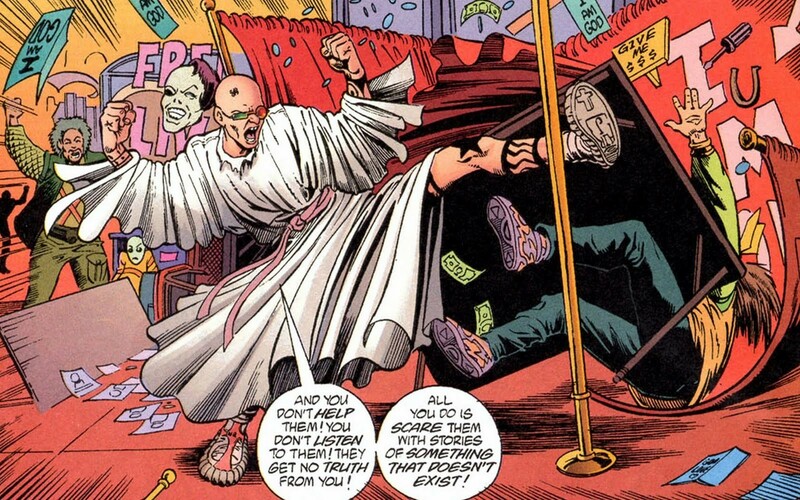 My favourite read this year has been Transmetropolitan written by Warren Ellis and co-created and designed by Darick Robertson. I usually read manga/Japanese comics, and joined the library’s graphic novel group to expand my reading into more western-style comics. Transmetropolitain is a great mix of weird, surreal, pseudo-political, futuristic sci-fi that I really enjoy. 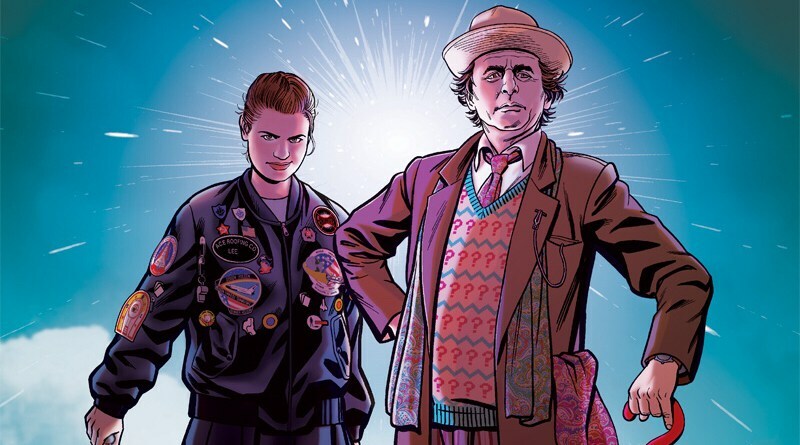 I think it has a great script, strong and funny characters and fabulous artwork to give depth to the whole universe, and I probably never would have discovered it without the group. What I like about attending the reading group is that we get read things I wouldn’t necessarily want to read myself, but it allows me to hear from from other perspectives what resonates with them about the books. Because there is no standard format for comics in terms of art style or presentation, people tend to gravitate to different elements of a graphic novel, and it’s nice being able to see what types of art have the most impact on people. I like that a couple members of the group are also interested in other social events related to comics and it’s a good opportunity to learn more about what wider comics events are happening around London, and who is involved. It’s a great starting point to open you up about the possibility of involving yourself with other comics events. My favourite graphic novel that we read at the library’s reading group this year was Miracleman by ‘the original writer’ aka Alan Moore. The story really drew me in as it explored some ideas I didn’t expect to see come up. I could see the beginnings of how Alan Moore would approach deconstructing the concept of the superhero and the world they live; an idea that he would take even further in Watchmen. But honestly I felt that of the two books, Miracleman was the easier to digest. It was more of a personal journey and transformation of one guy discovering what it means to be a superhero in the real world. Delving into the toll that the title of ‘supehero’ would take on you and the ones around you. Including the sacrifice of one’s humanity, and being forced to ascend into something more. Which came with its own questions of how the world would regard such a being. I read ahead onto the further volumes and appreciated how the story evolved into something grander each time. 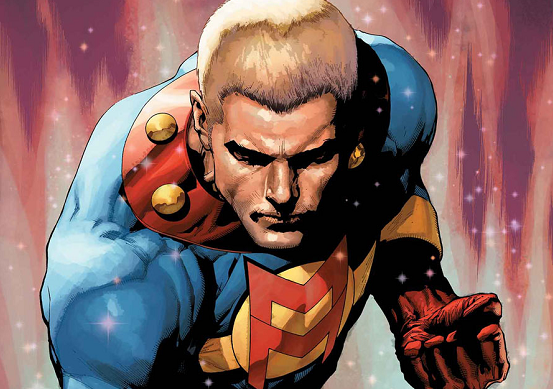 It focused on the progressively wider circle of influence Miracleman had on people in life, the world around him, and the possible utopian or dystopian futures he could bring about. Many, many thanks to Mike, Lara and Tari for sharing their thoughts with us. They’ll next meet on Monday 12 February at 6.30pm and they’ll be discussing The Flintstones by Mark Russell. Like to get involved? Email david.bushell@rbkc.gov.uk for more info. We’d also like to thank Gosh Comics and the London Graphic Novel Network for their support. Watchmen begins as a murder-mystery, but soon unfolds into a planet-altering conspiracy. The reading group takes place on the first Thursday evening of every month. See you there! Bring snacks!